The vast majority of us Brits support onshore wind - a whopping 76%! But the government has banned it - pandering to the tiny minority who don’t like it. Our new figures show that this small group are more than twice as likely not to believe in manmade climate change, compared to the rest of the population. This means that the government is basing their renewable energy policy on the opinion of people who don’t recognise the need for renewable energy. In 2015 the government introduced planning blocks that have all-but stopped anyone building onshore wind turbines in England. The reason they gave for this was that communities don’t support onshore wind. But there’s a problem with that excuse. 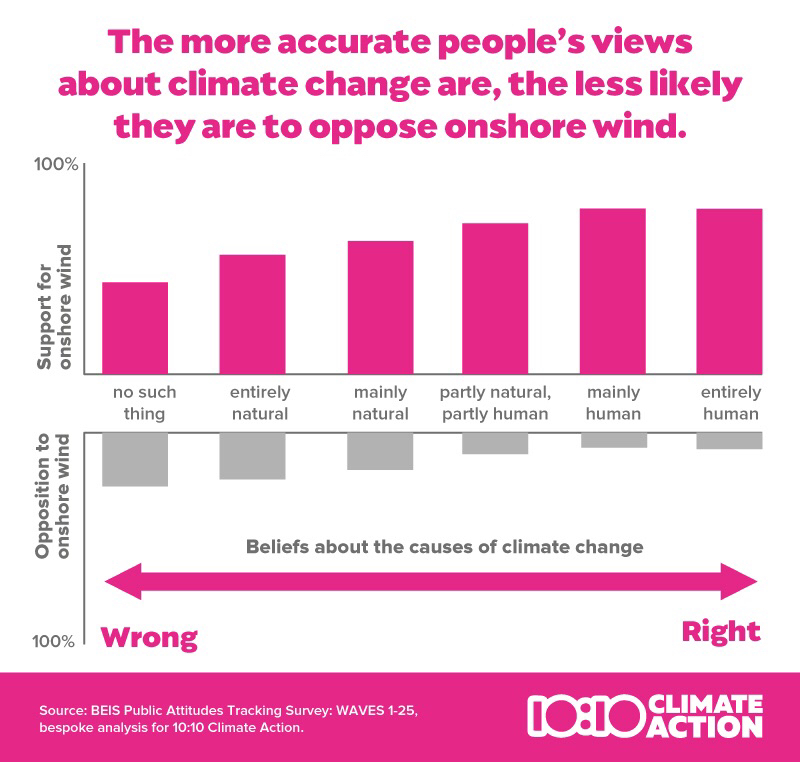 We know from the government’s own data that the overwhelming majority of people - now a record 76% - support or strongly support onshore wind. And we know that the number who oppose is just 7%. The government is basing their policy on the opinion of an incredibly small group of people. We dug into the even smaller group of people who strongly oppose onshore wind - just 2% of the British population. Our analysis shows that this group is 2.5 times more likely than the general population to believe climate change doesn’t exist, or is mainly a natural phenomenon. Basically, the less you believe in manmade climate change, the higher the chance that you will be against onshore wind. We also found that this group is likely to be older. A person over 65 is seven times more likely to strongly oppose onshore wind than a person under 45. In the context of climate change, the government has banned onshore wind to pander to an incredibly small group of people - many of whom don’t accept that humans are causing climate change at all. We cannot let the opinion of these people stop onshore wind in its tracks, just at the moment we need to scale it up to tackle climate change. Right now, the government are consulting on the planning blocks they introduced in 2015. This means we have an opportunity to change them. The government’s decision should be based on the huge majority of the British public who support onshore wind - not the tiny minority who don’t. Let’s stand up for onshore wind, and show the government how big that majority is.